Of all U.S. businesses seeking to become part of the global marketplace and improve their chances of surviving the current crisis, franchisees are at the forefront of the curve. This article vividly demonstrates how even smaller players successfully incorporate international expansion into their growth strategies. Of course there are number of issues that arise the moment company decides to expand abroad. We talked about them in the past and we will continue to highlight them going forward. Yet, there is one consistent message, which one hears from everyone who has taken their franchise company abroad. If done correctly, the rewards far outweigh the risks. Hope you enjoy this week’s article and I welcome your comments. Many American franchises are not only surviving the recession but thriving in it by expanding their operations globally. Photography by Natalie Brasington Matt Friedman maps out wing zone global strategy. Friedman decided that while the U.S. franchise market was stuck in its malaise, the best thing for his company to do was let the rest of the world pit their taste buds against his Nuclear Wings, and last November, the company opened its first restaurant in Panama City, Panama.But it was not a decision Wing Zone made lightly. Entering into international operations adds levels of complexity to a franchise organization, and it takes a hefty outlay of cash. It also takes deep research into new markets, months or years of tweaking and, of course, there’s the risk that a bad international experience could drag down domestic operations. Despite the risks, Wing Zone is not alone in looking west–and east and south and north–for growth opportunities. “In the last few years, U.S. brands began saying, ‘Wait a minute, we’ve never looked anywhere else, but maybe we ought to,'” says William Edwards, an international licensing consultant in Irvine, Calif.
Now, many of the international expansion plans born in the depths of the recession are reaching fruition. “2011 has started out as a boom time for international franchising–and not just for food. Service brands, retail, children and management education are all going international,” Edwards says. No one is tracking exactly how many businesses are adding global elements, but companies like Massage Heights, the fire and water cleanup companies PuroCleanand Servpro, Molly Maid and the fondue restaurantMelting Pot have all gone abroad in the last couple of years, and established franchisors have ramped up their international efforts. Recently McDonald’s, Dairy Queen and California Pizza Kitchen, along with dozens of other franchisors, have pushed hard into China. Malaysia, India, Indonesia, South Korea, Brazil and Vietnam are all attracting American companies, and they aren’t just random spots on the globe. According to Williams, these countries have key elements that allow American brands to succeed, including a GDP growth at 4 percent or above, and an emerging middle class with spending power. A mall’s worth of franchises have even announced plans to open in affluent parts of the Middle East, including Kuwait, Bahrain, the U.A.E. and Saudi Arabia. Some brave souls are even venturing into Iraq. For smaller players–like Wing Zone, with fewer than 200 units–the idea of going global was not even on the radar a few years ago. But now they see it as a unique opportunity. Not only does it circumvent the financial problems in the U.S., it gives them a level playing field on which to build their brand. So instead of competing head-to-head in a crowded domestic market (in the wings world, that includes Buffalo Wild Wings, Wingstop, Wingstreet, Wings n Things, Hooters, Planet Wings and Wingman, among others), smaller franchisors are finding that building their reputation in countries hungry for Western brands and without the scrum of competition is a smart move. The Little Gym, a noncompetitive children’s learning and physical development program that began franchising as The Little Gym International in 1992, learned the first-to-market lesson early on. Serendipity in the form of two interested Thai investors led them to open their first international franchise–something that was not in their business plan–only three years after launching. But that experience set the direction for their future growth: Now the company is an experienced overseas operator with 300 locations in 21 countries. As other child-focused brands are beginning to make overtures toward Asia and other areas to boost their growth, The Little Gym is already positioned to ramp up its international efforts and be the first to enter those lucrative markets. The company recently furthered expansion into the Middle East, signed master franchise agreements for India and Mexico and opened a location in China, with plans to open as many as 100 there. For Wing Zone, which is just starting out in the global franchising world, finding the right location was the first step in expanding the brand. It needed to be a country that could appreciate the spiciness of hot wings, that had a delivery culture (the core of the Wing Zone concept), a fondness for poultry and the crucial middle-class element. Panama fit the bill, but the Wing Zone concept still needed tweaking to fit the culture. The footprint of the restaurants was increased to 1,500 square feet and seating for 40 to 60 people was added, an element missing in the U.S. locations. Of course, there were setbacks. They get their chicken locally, but keeping the kitchens stocked with all their other products and proprietary sauces was a problem, since those had to be shipped from the U.S. But the 18-month lead-up to opening day gave them plenty of opportunity to make changes, and it paid off. The first week of operation in Panama City was the busiest week for any Wing Zone, foreign or domestic. Friedman now has deals in El Salvador and the Bahamas, he has signed agreements with England, Ireland, Scotland and Saudi Arabia and he’s signed on with one of Japan’s most experienced franchising companies to open 50 restaurants in and around Tokyo. On the other hand, franchisors can’t look at international area developers or franchisees as independent entities. They need to offer the same type of support and guidance they give to their domestic franchisees. Friedman says he treats his Latin American Wing Zone franchisees the same as his domestic units, though they are held by a subsidiary, and he has made sure there is a local support staff that franchisees can rely on. Even if the domestic franchise market heats up again, it’s unlikely that American brands will lose their taste for the international market. In fact, some iconic domestic brands are more international than American. Yum! Brands, which owns Taco Bell, KFC and Pizza Hut, earned 65 percent of its 2010 profits internationally, and expects that number to hit 75 percent by 2015. Over 60 percent of McDonald’s sales are in the international market. This article was originally published in the May 2011 print edition of Entrepreneur with the headline: No Boundaries. Dear Readers, as media partner of the New York Enterprise Report, Princeton Council on World Affairs is pleased to extend a 25% discount offer to the entire Fluent In Foreign community. At this event, I will be conducting a workshop on international partner selection. The New York Enterprise Report is proud to present the 2nd annual International Business Opportunities Conference. Incorporating lessons learned from the latest opportunities and pitfalls, this timely event will provide attendees with critical information and resources needed to thrive in the growing global marketplace. – Are you struggling to finance your international business? – Do you know strategies to mitigate risks when going global? – What are the latest opportunities and pitfalls in doing business overseas? – How do you find the right international trade partnerships? If you are currently doing business overseas or are considering doing so, this is a “must-attend” event. This conference will feature 6 sessions designed to help you achieve international business success. During this panel, 3 successful business owners will discuss how they have been able to grow their businesses overseas and handle the conditions of international markets. Learn how they evaluated the opportunities, penetrated the market and managed the necessary elements to create a thriving global business. You found your customers overseas and the orders are rolling in but what options are available to finance your international sales? This panel will address how to access capital to fund your international growth as well as financial methods and tools including trade finance and credit insurance used to conduct international business transactions successfully. The need for risk mitigation is crucial to your success when doing business overseas. This breakout session will help you understand the crucial keys to risk management including payment risk, legal risk, taxation and intellectual property. As an international business person, the ability to understand the culture of the countries you’re working in is vital for your success. In this session, you’ll learn how to effectively observe, analyze, and function in different business cultures, as well as learn the cultural implications of marketing and negotiating decisions in unfamiliar international business settings. International trade partnerships are an increasingly important area of market entry. This session will outline the methods companies can use to select and vet the right local partners and how to construct an in-country support network. Attendees will learn the various forms of partnerships, and advise you on how to negotiate a win-win partnership agreement. For more information or to register, visit www.nyreport.com/internationalconference. InvestUKRAINE – Save the Date Announcement!! Today we begin a series on expanding abroad through franchising. 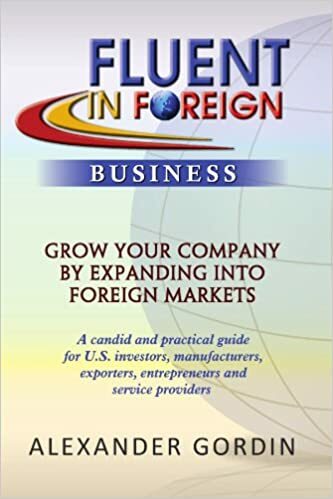 Although a number of well established players in the hospitality, education and fast food industries have successfully expanded abroad for decades, growth in foreign markets still represents huge opportunity for franchise businesses. According to IFA’s(International Franchise Association) latest member survey, more than 84 percent of franchise businesses say international expansion is, “key to their development”. Many iconic American brands, such as Yum Brands’ KFC, are growing more rapidly overseas, due to market saturation and the pure potential of developing countries and markets like Asia and parts of South America. Upon the recent announcement that Yum was selling its Long John Silver’s and A&W brands, the franchisor released a statement that highlights its focus on foreign markets. “As we continue to sharpen our long-term growth focus on international expansion and improving our US brand positions in KFC, Pizza Hut and Taco Bell, Long John Silver’s and A&W no longer fit our long-term growth strategy,” Yum CEO David Novak said. With international expansion come challenges such as financing, territory demarkation and development, intellectual property, market adaptability and many others. Today’s post highlights the intellectual property concerns unique to foreign markets. Zeidman, head of DLA Piper’s franchise legal practice, cautions franchise brands considering expanding overseas to beware of the lack of sophistication in certain markets regarding IP issues. “Franchising regulation in the United States is now in its fifth decade and is sufficiently developed that most companies and lawyers are at least aware of its existence. Not so outside the US,” he notes. One of the issues franchisors may have to deal with overseas has to do with copycat stores. What is an established franchise is to do when copycats begin popping up in foreign countries? WSJ’s Laura Burkitt describes fake stores throughout China whose branding looks a lot like the real thing. Reuters photo. Suddenly, one of the most famous Apple stores in the world is one that not only isn’t a real Apple Store, but apparently isn’t even an authorized Apple reseller. Welcome to the modern era of copying in China, in which sophisticated proprietors of knockoff stores and chains are targeting increasingly sophisticated Chinese consumers with store experiences and customer service extremely similar to the real thing, down to the helpful store maps, coupons, shopping bags and employee uniforms. Which is the original and which is the imitator? Scroll to the end of the article for answers. The imitation retailers and restaurants go beyond the simple fakes of consumer goods that have long been abundant in China. Indeed, in some cases, they aren’t even selling fake goods: the phenomenon gained global attention last month when a foreign blogger in the southwestern city of Kunming posted photos of a fake Apple Store selling real iPads and iPhones in a setting remarkably similar to Apple Inc.’s trademark retail outlets, and identifying itself as an Apple Store without the U.S. company’s permission. Imitation retailers and restaurants aren’t new in China, but analysts and executives say they have proliferated in recent years. The trend reflects growing awareness of the importance of things like design and customer experience among entrepreneurs in China, where people long ago perfected the art of making imitation goods but where companies have been less successful building their own consumer brands, said Wei Xiaopo, an analyst at CLSA Asia-Pacific Markets. “Chinese companies know that service and experience have become among the most critical parts of branding for businesses that operate in China,” said Mr. Wei. While China is hardly the only country to have problems with commercial fakery, what happens here now matters enormously for multinational companies, because China is the world’s most important growth market for consumer goods. Retail spending is expected to reach 27.4 trillion yuan ($4.3 trillion) by 2015, up by more than two thirds from the level last year, according to the Chinese Academy of Social Sciences, a government think tank. China’s government has acknowledged problems with piracy, and has taken measures to address it that some foreign executives and experts say are starting to make headway. After the fake Apple Store was highlighted last month, Kunming officials initiated a sweeping inspection of electronic stores in the city. It’s unclear whether they have taken any action against the Apple store, whose staffers now refuse to answer queries over the phone. The fake stores present new complications for global companies that have long struggled to protect their brands in China. Some executives say that fake stores can help build brand awareness. 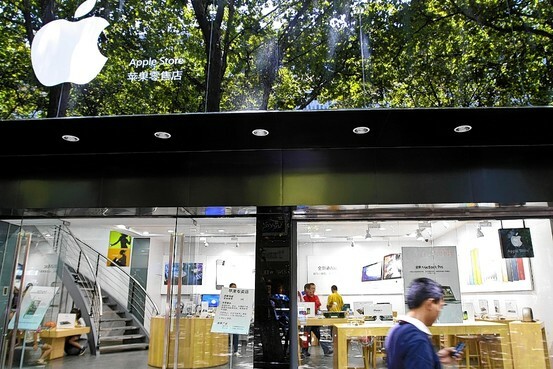 And in cases of unauthorized resellers like the Apple store in Kunming, the foreign company is still benefiting from sales of its own products. Alexander Moody-Stuart, managing director at sandwich chain Subway, said the number of imitators that come to franchising fairs in China increases every year. He said there are Subway copiers that use similar logos, offer sandwiches in six-inch and 12-inch formats as Subway does (China generally uses the metric system), and even accept coupons from Subway when consumers confuse the two stores. For Subway, which is trying to build awareness to a type of food that isn’t always eaten in China, “the mimicking isn’t exactly a bad thing,” Mr. Moody-Stuart said. But the imitation stores also limit the companies’ ability to control the experience that consumers have with their brands. Copycat companies run the risk of tarnishing a consumer’s association with an already established brand at a time when Chinese consumers are increasingly brand-conscious. 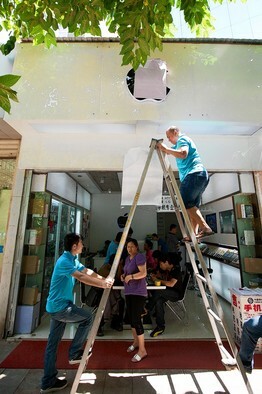 Apple, for example, wasn’t able to oversee the service or hire the employees at fake stores like the one in Kunming the way it does painstakingly at its own outlets. Walt Disney Co. has similar difficulties: a number of “Disney Stores” are open in China, even though the U.S. company hasn’t yet launched its trademarked chain of stand-alone retail shops in the country—although it does license its products for sale in the Chinese market. Spokeswomen for Apple and Disney in China declined to comment. Copycat stores range from small regional operations, such as 11 Furniture, which runs two stores, to larger Dairy Fairy-type national franchises. To some degree, the copycat stores illustrate that there’s demand that’s not being met, because some foreign companies haven’t expanded into huge swaths of China’s interior, said Torsten Stocker, a Hong Kong analyst for Cambridge, Mass., consulting firm Monitor Group. Apple, for example, has only four of its stores in China—in Beijing and Shanghai—though it licenses resellers elsewhere in the country. Swedish furniture giant IKEA Group hasn’t yet expanded into China’s far western cities like Kunming, where a Chinese company called 11 Furniture is mirroring IKEA’s store marketing strategy—everything from its blue-and-yellow colors and in-store room displays to special golf pencils and crinkling plastic bags. Just like IKEA does, 11 Furniture uses blue signs and yellow arrows on the floor to direct consumers through mock living rooms, where sofas sit opposite flat screen TVs and tables that look like they should have names like Folkvik and Liatorp (instead of Shuwei Kela Chaji). Not everything is knockoff in imitation outlets. At Dairy Fairy, a national franchise chain that opened in 2008, ice cream, including the Blizzard-like “Ice Storm,” is served upside-down, just like at Dairy Queen, which has 360 stores in China. Cups are marked with “DF” in red and blue, resembling the colors Dairy Queen uses and its “DQ” nickname. Dairy Fairy employees are donned in blue uniforms with red aprons—nearly a mirror image of Dairy Queen employees. But at a Dairy Fairy in Beijing on Tuesday, the menu also included items that one wouldn’t find at a DQ, such as spicy-pepper-flavored ice cream. Dairy Fairy declined to comment and didn’t offer details on the number of stores it operates in China. Dairy Queen vice president of international marketing Justin Holtkamp said the company isn’t aware of Dairy Fairy, but that it has other imitators, who just use the company’s name or call it “Dairy & Queen.” Dairy Queen has shut down two stores that infringed its trademark within the last year, he said. 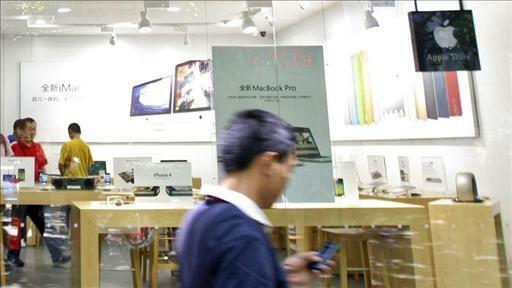 Bloomberg News The Apple logo was covered up recently at a fake store in Kunming. Some proprietors say their company’s similarity to known brands is a coincidence. At Jambo Juice in Beijing, where smoothies are made on-the-spot so consumers can add so-called energy boosters and opt for antioxidants, the green signs and tropical colors are familiar to anyone who has ever patronized U.S.-based chain Jamba Juice, which doesn’t have outlets in China. But Jambo’s founder, Ye Jiabin, says he got the English name from an African language (it is a greeting in Swahili), and is now considering changing the name because it is too similar to the U.S. company. “We’ve just always put more emphasis on the Chinese name”—which is Jiang Bao—he said. Still, the scale of some examples is startling. In Changzhou, Jiangsu Global Digital Cultural Theme Park Co. has opened a park called Global Animation Joyland, which bloggers have called attention to because it includes a section that appears to be based onActivision Blizzard Inc.’s World of Warcraft massive multiplayer online game. Activision Blizzard said it hasn’t licensed the use of its intellectual property to Joyland or any other theme park, and is “actively looking into the situation.” The Chinese version of World of Warcraft, operated through a licensing agreement by Chinese Internet company Netease.comInc., is one of the most popular online games in China. Netease didn’t respond to requests for comment. Joyland, a park that opened with blessings from local officials, also includes licensed sections devoted to other brands including “Mo’er Manor,” based on an online community for children by New York Stock Exchange-listed Taomee Holdings Ltd., and a store carrying official merchandise of Walt Disney Co. The theme park company declined to comment. Three of the stores were imitators; three were genuine. Apple Store: Image A shows the exterior of the Apple Store in Chicago. 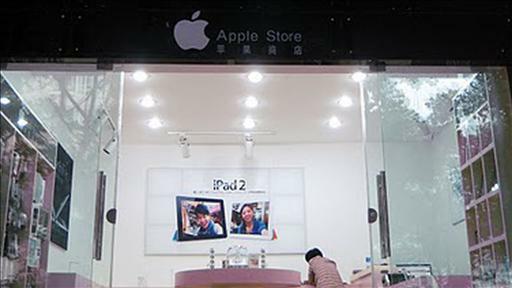 Image B shows a store in Kunming that sells Apple products and copies the company’s layout. 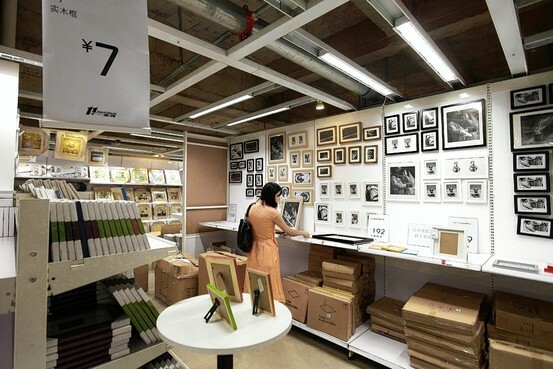 IKEA: Image B shows IKEA’s first store in Beijing. 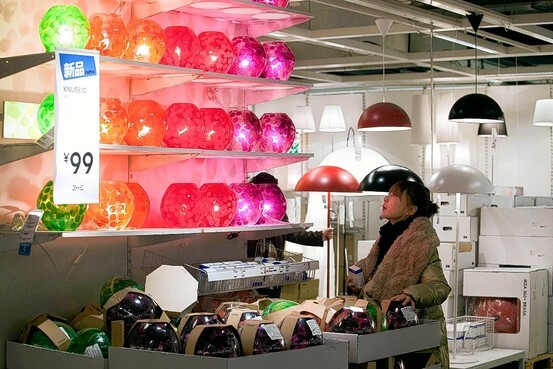 The Swedish retailer has nine stores in China. Image A shows 11 Furniture store in Kunming, a city in southwest China. Dairy Queen: Image A shows the inside of a Dairy Queen store in Shanghai. The chain has 360 stores in China. 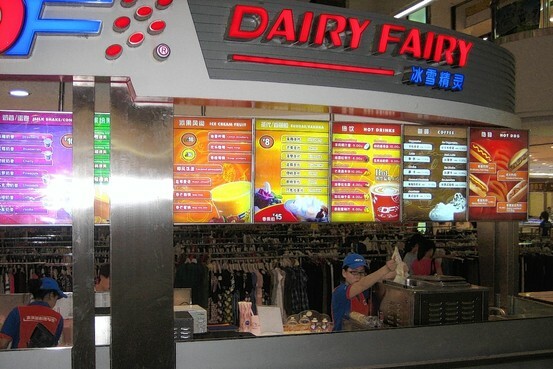 Image B shows a Dairy Fairy store in Beijing. The chain’s menu is like that of a Dairy Queen. —Melissa Powers and Yoli Zhang contributed to this article. “These copycat stores will likely dilute the quality of the brand, the products and the service a brand has worked so hard to protect,” according to international franchise development expert Bill Edwards, Chief Executive Officer of Edwards Global Services. Edwards, who has been to China on behalf of U.S. franchise brands four times in the past year, has seen the challenges copycats pose firsthand. As foreign governments begin to welcome U.S. brands to their shores, they are also stepping up their enforcement of copycats. “The Chinese government has been getting better in the past 3 years in enforcing trademarks,” said Edwards. Copycat enforcement has not been exclusive to franchise brands or the food service industry. 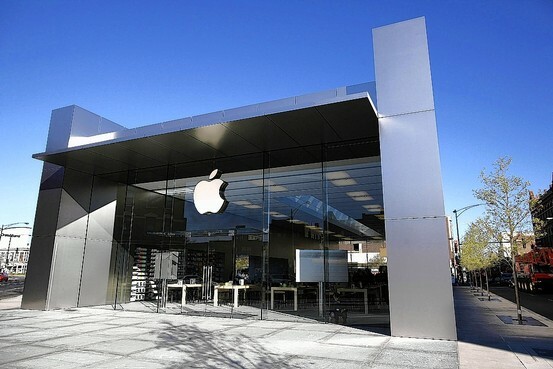 The Chinese government moved on the fake Apple stores quickly when they were exposed in the press, as the aforementioned WSJ article noted. Experts do point out that as the consumer becomes more sophisticated in developing countries; they want to be seen eating or shopping at the right brand and not a copycat. “The increasingly well-to-do and sophisticated middle and upper class consumer knows the real brand and wants to be seen eating at the right brand,” said Edwards. China is not the only place where there are copycats. Edwards points out other examples of franchise concepts outside China in Australia as some of the most challenging countries for expansion due to copycat brands that had already taken a hold in the country. “Burger King® had to become Hungary Jack®. Two Men and A Truck® had to use Movers Who Cares® and Batteries Plus® had to use Batteries Staff® just to market their franchise in Australia,” he said. For more information about protecting your franchise brand internationally, visit the IFA’s International resource page. Washington, D.C. – United States Trade Representative Ron Kirk today called for swift congressional action on legislation for pending trade agreements between the United States and South Korea, Colombia, and Panama, along with renewal of Trade Adjustment Assistance reforms and expired trade preference programs. President Barack Obama formally submitted the legislation for the three pending trade agreements to Congress today. Under Trade Promotion Authority already granted by Congress, the legislation for the trade agreements may not be amended, and Congress has 90 days to hold up-or-down votes on each. Changes to the legislation would make it subject to normal rules and procedures, including amendment and filibuster. In 2010 and 2011, the Obama Administration worked with South Korea, Colombia, and Panama to successfully address outstanding issues related to each of the three agreements. In particular, the Administration secured: greater U.S. access to the South Korean auto market; significantly increased labor rights and worker protections in Colombia; and enhanced tax transparency and labor rights in Panama. The Administration has been clear that once approved by Congress, agreements will enter into force only if trading partners are meeting their commitments; for instance, Colombia must successfully implement key elements of the agreed Action Plan Related to Labor Rights before the U.S.-Colombia trade agreement will enter into force. Colombia has met all milestones to date as specified in the Action Plan, including enactment of several far-reaching reforms. Legislation for the U.S.-Colombia trade agreement also includes a renewal of the Andean Trade Preferences Act. ATPA was enacted in December 1991 to help Andean countries in their fight against drug production and trafficking by expanding their economic alternatives. Late last month, the Senate approved legislation to renew the Generalized System of Preferences and also to streamline and save costs on a renewal of Trade Adjustment Assistance reforms. The Senate has sent that legislation to the House, where the Speaker has committed to its consideration in tandem with the pending trade agreements. The Generalized System of Preferences expired in December 2010. It promotes economic growth in the developing world by providing preferential duty-free entry for products from designated beneficiary countries and territories; GSP also supports American jobs and improves American competitiveness as many American businesses use GSP imports as inputs to manufacture goods in the United States. TAA provides training and support for American workers who are negatively affected by trade and is traditionally in place as trade agreements pass. It is designed to help workers, firms, farmers and fishermen transition to alternative employment. The bipartisan compromise negotiated by Senate Finance Committee Chairman Max Baucus (D-Mont.) and House Ways & Means Committee Chairman Dave Camp (R-Mich.) is consistent with the goals of the 2009 law that improved the scope and effectiveness of the program – for instance, covering Americans employed in the services sector in addition to U.S. manufacturing workers. TAA is an essential component of President Obama’s balanced trade agenda. A fact sheet on the U.S.-Korea Trade Agreement is available HERE. A fact sheet on the U.S.-Panama Trade Agreement is available HERE. A fact sheet on the U.S.-Colombia Trade Agreement is available HERE. A fact sheet on Trade Adjustment Assistance is available HERE.